Yum! Brands Inc, which operates KFC, Pizza Hut and Taco Bell, announced that December sales at same stores were up 1% across China, where a spinoff of operations will take place this year. Sales at comparable stores for KFC were up 5% in China, said the company based in Louisville, Kentucky in a Tuesday filing. Although, they fell by 11% for Pizza Hut, sales performance showed an improvement from the numbers in November, when China’s sales dropped by 3%. Yum!, crumbling under activist investor pressure, announced in October it would spin off its business in China into a publicly traded business that will stand on its own. This move will help Yum to focus on improving its sales in China, where the market turmoil along with scandals over food safety have weighed down its results. During the fourth quarter, which is from September through December in China, sales at same stores were up 2%. Shares were up as high as 3.5% in New York trading late Tuesday afternoon. Yum! was up 0.3% during 2015, outpacing the drop of 0.7% by the S&P 500 Index. The gain during the fourth quarter for restaurants that have been operating 13 months or more in China includes 6% growth for KFC and a decline of 8% for Pizza Hut. Yum receives over half its overall revenue from the country of China, where it has more than 6,900 restaurants. Yum announced that it is expecting growth in delivery as well a new loyalty program at KFC being introduced across the Asian nation. 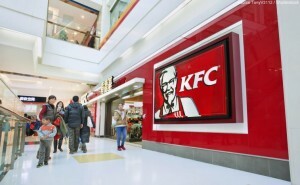 It has also focused on selling additional healthful foods and breakfast items at its chain of fried chicken restaurants. Yum has experienced results in China that have hurt its bottom line due to a scandal over food safety in 2014, where a supplier had been accused of selling meat that was expired. There is also a great deal of economic volatility as well as more competition from local fast food. The company will report its full earnings for the fourth quarter on February 3.